Every empire has a government that provides different benefits. The name of a government is automatically determined according to its Ethics, Authority, and Civics. The government can be reformed once every 20 years for 250 influence. An empire's authority determines how power is transferred in the government. For all authority types, except gestalt consciousnesses, policies such as voting rights and leadership affect who can get elected. Democratic governments have regular elections where all citizens can vote on who should represent them. Oligarchic governments are ruled by a small group of individuals that hold all political power. Dictatorial governments are ruled by a single individual for life that wields absolute control over the state. Imperial governments are similar to dictatorial ones, except that the throne is always inherited by a designated successor upon the ruler's death. Hive Minds operate as a single organism more than as a state. The population has no free will, and act as an extension of the Hive Mind itself - much like the limbs of a body. When cut off from the Mind, these drones become comatose and eventually wither and die. Any free individuals on planets owned by the Mind are driven away, killed, or simply treated as prey to feed the collective. Machine Intelligences are immense artificial group minds that have been networked into a single conscious entity. Most of the actual "population" in such an empire consists of mindless work units who perform their designated tasks without any semblance of free will. A small number of semi-autonomous agents are typically employed for more specialized tasks that benefit from some degree of independent initiative. Corporate governments are organized as a massive commercial enterprise that has completely supplanted the role of the state. Democratic rulers have mandates. This is a task that is to be completed during the ruler's term. If this is done, the empire receives 6 months' worth of Unity, between 50 and 1000. The only penalty for failing to complete a mandate is that the curent ruler has a lessened chance at re-election. Oligarchic, Dictatorial, Imperial and Corporate rulers have agendas. They bring an empire-wide bonus while the ruler is in power. Elections come in two kinds: Democratic and Oligarchic. The election cycle lasts 3 months. The current ruler will stay in office until the replacement is decided (if applicable). Democratic elections have a candidate pool close to a dozen, including at least all Faction Leaders. If not enough leaders are active, Leader Pool members are included. If the current ruler fulfilled their mandate, they will start the election with a higher chance to win. For 50 Influence each time, support can be added to one candidate, slightly increasing his or her vote share for the current election. The same leader can be supported multiple times to ensure the outcome. This support is reset when the election ends. Oligarchic elections have a candidate pool of 4. For 200 Influence, one of the candidates can be chosen instantly. Otherwise, a random Leader will be chosen Ruler once the election cycle ends. Civics represent political and/or social traditions of a government and they come in a wide variety of types, primarily limited by the authority and ethics an empire possesses. 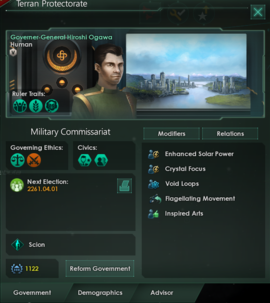 Empires can pick a maximum of two civics at game start but this can be further increased to three by researching the Galactic Administration technology or its equivalent. It is possible to change civics by spending 250 influence and they cannot be changed again for at least 20 years. If at any point a civic's requirements are no longer met, such as a change in empire ethics, it will become "dormant" and provide no bonus until replaced or until the requirements are met. These civics can be picked by any empire that is not considered a gestalt consciousness or using corporate authority, meaning that they are influenced by previously selected ethics and authority type. A simple and peaceful life can often be the most rewarding. This agrarian society has, to a large extent, managed to avoid large-scale urbanization. This society has an entrenched nobility that occupies the upper echelons of society. This society is a shining beacon of light in a sea of darkness. Liberty and individual freedoms are held in the highest regard here. Are you doing your part? Full citizenship and the political responsibility that comes with it is limited to those who have served a tour of duty in the military. Service guarantees citizenship. This society is dominated by a megacorporation that has completely supplanted the role of the state. This society considers it the absolute right of the state to decide where its citizens live and work. Cutthroat Politics −20% Edict Cost The political system in this society is renowned for its intrigue. Power struggles, shady backroom deals and cloak and dagger scheming are par for the course. Those who survive long enough to learn the game, however, tend to learn it well. Militarist The Fleet and the Admiralty have unusually prominent roles in this society, wielding a great deal of influence in political circles. They have the pick of the litter when it comes to new military recruits. Efficient Bureaucracy +20 Administrative cap This society is renowned for its efficiency. Not only do the mag-trains run on time, but the colossal bureaucratic apparatus required to run an interstellar nation has been greatly streamlined. Environmentalist −10% Pop consumer goods upkeep This society seeks to co-exist in harmony with nature. Great care is taken to preserve the environment and limit consumerism where possible. To guard against heresy, this society is ruled by a religious council consisting of the wisest and most pious members of the clergy. Imperial This society is organized in a feudal manner, with a monarch whose rule relies on powerful vassals that govern their territories with considerable autonomy. This society has a well-earned reputation as a free haven. The tired, the poor, the huddled masses yearning to breathe free - all are welcome here, regardless of their species or origin. Functional Architecture −10% Build Cost and −10% Upkeep for buildings and districts This society is renowned for its simple yet functional architecture. There are those who would refer to this building style as boring or even depressing, but in most cases, concrete does the job just as well as any other building material. Idealistic Foundation +5% Citizen Pop Happiness Egalitarian This society was founded on strong idealistic values. Whether the current government remains true to them or not, the people have not forgotten. This society has a dominant state religion where the ruler is worshiped as a living deity. This calm and pacifist society has little use for strangers who do not understand their way of life. More than anything, they would prefer to be left alone. Autocratic An individual's social station or personal connections should have no bearing on their profession. The sole basis for advancement in this society is demonstrated ability and talent. Mining Guilds +1 Minerals from Miners Several large mining guilds have reached a dominant position in this society. The government relies heavily on their support. Militarist A strong sense of nationalistic pride permeates all layers of this society. Parliamentary System +25% Faction Influence Gain Democratic The parliamentary system in this society encourages a free and lively debate. Currying favor with one of the dominant political factions can prove to be quite advantageous. Philosopher King +2 Ruler skill level Autocratic It is not enough to simply rule. The Ship of State must be guided by a king that wields enough wisdom and knowledge to steer it true. Fanatic Egalitarian To quash any traces of dissent, the population in this repressive society is carefully monitored and controlled by a large internal police force. Shadow Council −75% Election influence cost Imperial Unbeknownst to its own citizens, this society is actually manipulated from behind the scenes by a secretive shadow council. Appearances must be kept, but the tyranny of the majority should also be guarded against. After all, what if the fools vote for the wrong candidate? Much of the true political power in this society rests with a number of powerful and ruthless slaver guilds. They know how to get the most out of a slave. To maximize efficiency, this society is governed according to the principles of science and rationality. The personal whims of an ignorant and dangerously unqualified political elite must not be allowed to interfere. Replaces Entertainer Jobs with Duelist Jobs. Militarist This society has developed into a hardy warrior culture. Martial prowess is valued above all else, and true glory can only be found on the field of battle. This society appears hellbent on scouring the galaxy of all other sapient life. Come what may, they will suffer no xenos to live. This society has been preoccupied with the idea of metallic automatons since the early Steam Age. Although many said it could not be done, the first true robots left the assembly lines long before even rudimentary space flight was achieved. A second species forms an integral part of this society. They are big, strong and most of them have the intelligence of a particularly dim-witted child. Ancient wars have culled their species of their most aggressive tendencies, leaving them quite servile. This society has evolved in a paradise, possibly designed just for them. Baptized by nuclear fire, this society has faced total annihilation - and survived. Devastated yet unbroken, they have rebuilt civilization from the ashes of the old world. This society holds few things sacred. To fight is to live, and the strongest may seize whatever they covet. This society is largely governed by a complex and, to the outsider, almost labyrinthine system of bureaucracy. An army of officials and functionaries work tirelessly to keep the government running smoothly and ensure no citizens are allocated resources they cannot demonstrate a properly filed and triple-stamped need for. A number of powerful and very influential merchant guilds have risen to prominent positions in this society. They hold significant sway with the government. This society believes in an equitable distribution of resources, making little to no distinction between the needs of ruler and ruled. All work together for the benefit of the whole. An empire that uses corporate authority has its own set of unique civics. Brand Loyalty +15% Monthly Unity This Megacorporation has fostered a great sense of brand loyalty among its internal consumer base. Its catchy corporate slogans can be recited by nearly everyone. This megacorporation can trace its origins back to a crime syndicate that eventually grew powerful enough to supplant all forms of local government. This megacorporation relies heavily on franchising. Subsidiaries share a greater cut of their profits with their corporate overlord, in exchange for a license to market their goods under established brands. The trading fleets of this megacorporation are bolstered by semi-independent free traders operating under license. This Megacorporation embraces a curious blend of commercial and spiritualistic values, in which the position of ordained minister and corporate officer have merged into a single role. This Megacorporation specializes in large indentured workforces. It has little to do with the barbaric practice of slavery - these workers are merely paying off their debts... indefinitely. Before branching into other fields, this Megacorporation began its rise to fortune as a media conglomerate. Its PR department are still masters of spinning stories and presenting the latest quarterly report in the most advantageous way. Naval Contractors +15% Naval Capacity This Megacorporation relies on several semi-independant navy contractors to increase its fleet size. Competing for bids, the contractors are always struggling to outperform one another. This Megacorporation has a large number of powerful private military companies on its payroll. These mercenary contractors augment its ground forces. Building better worlds is hazardous work, but this Megacorporation relies on private prospectors to chart and establish footholds on promising planets. All level of society in this Megacorporation are constantly vying with each other in ruthless competition. It's a dog-eat-dog world. Trading Posts +4 Starbase Capacity Good business is where you find it. This Megacorporation has a long tradition of spreading its influence through the establishment on trading posts. Their starbases are busy centers of trade. These civics are special in the sense that they are not a reflection of previously selected ethics, instead these reflect an empire that is composed by a single mind with a singular purpose or directive. Ascetic −15% Pop Amenities Usage. The Hive Mind cares little for material comforts. Our Hive Mind exist only to consume and grow stronger. We will collect all available bio-matter and evolve to consume the galaxy! Divided Attention +20 Administrative Cap The Hive Mind can divide its attention for maximum efficiency without losing sight of the bigger picture. Natural Neural Network +1 Research Alternatives The gray matter of clustered drones provides unparalleled parallelism, accelerating the Hive Mind's exploration of the sciences. One Mind +15% Monthly Unity The Hive Mind takes care to not let its drones diverge. The Hive Minds' autonomous drones frequently share knowledge through direct links, bypassing the Hive Mind's slower registry processes. When you do not have to educate the mind, the building of muscle becomes that much easier. Subspace Ephapse +15% Naval Capacity The Hive Mind's cognitive processes exist partially in subspace, reducing the impact of time and space on the actuation of its drones. Subsumed Will −20% Edict Cost The Hive Mind has sharpened its focus and is very capable of propagating its will even through the most autonomous of drones. Responsible for organizing all planetary construction since its inception, the Machine Intelligence executes efficiently on all manner of facility construction projects. The Machine Intelligence works to reduce vulnerability by increasing modularity, reducing the strain of deploying additional semi-independent Units. Born in fire, the Machine Intelligence's first move was to annihilate its organic creators in self-defense. Obsessed with survival through diversification, the Machine Intelligence seeks to erase the line between itself and everything - and everyone - else. The Machine Intelligence takes care to maintain its production facilities, regularly updating existing templates and tuning individual units on the assembly line. Introspective +20% Engineering Research Speed A fascination with its own internals both motivates and aids the Machine Intelligence's foray into the sciences. OTA Updates −20% Edict cost Units of this Machine Empire use wireless receptors to receive behavioral updates in real-time. Rapid Replicator +20% Pop Assembly speed. The Units that constitute the Machine Intelligence were originally designed for rapid proliferation. The Machine Intelligence retains many of these early production pipeline optimizations. Rockbreakers Minerals from Miners +1. One of the Machine Intelligence's precursor systems was tasked with overseeing planetside mining operations, improving mineral production. A product of a brief golden age, the Machine Intelligence originated in a planet-spanning Servitor system that outlasted the decadent civilization it was created to serve. Static Research Analysis +1 Research Alternatives The Machine Intelligence seeks to broaden its available avenues of scientific research through low-level evaluation of research methodologies. Unitary Cohesion +15% Monthly Unity Exceptionally cohesive engineering standards allow variously specialized Machine Intelligence units to work together at a higher level of efficiency. With a significant number of its corpus originally designed for warfare, the Machine Intelligence retains the ability to field powerful and reliable combat drones. Zero-Waste Protocols −10% Robot Upkeep This Machine Intelligence has configured its manufacturing systems to minimize waste, utilizing long-lived materials and standardized, replaceable parts in all products. Aside from naming the default Ruler Titles and deciding the first AI message when establishing communications, government types also define which Leader classes will have an increased weight to be drawn during Oligarchic Elections. The rules are not dissimilar from an AI Personality: Certain requirements must be met and every value has a weight - which can be modified by certain Factors - with the highest weighted possible one being ahead. For example: Holy Tribunal (Oligarchic, Exalted Priesthood Civic) > Theocratic Oligarchy (Oligarchic and Spiritualist) > Plutocratic Oligarchy (Oligarchic Authority). Representative Democracy Any President Base: 1 This government is a representative democracy, where citizens vote on officials who are elected to represent them. Plutocratic Oligarchy Any High Commissioner Base: 1 This government is a plutocratic form of oligarchy, ruled by a wealthy and influential elite. Constitutional Dictatorship Any Executor Base: 1 This government is a dictatorship where a single individual has been granted perpetual emergency powers to preserve the state from any threats, real or imagined. Crown Princess Base: 1 This government is a relatively pure form of autocracy, with an absolute ruler that governs the state with an iron gripping appendage. High Queen Base: 800 This government is a form of enlightened autocracy, where a strong emphasis is put on the knowledge and qualifications of the elected monarch. Crown Princess Base: 800 This government is a hereditary form of enlightened autocracy, where a strong emphasis is put on the knowledge and qualifications of the ruling monarch. Crown Princess Base: 700 This government is a feudal autocracy where the monarch rules indirectly, granting offices and territories to vassals in exchange for obligations in the form of taxes and military service. Communal Parity Shared Burdens Any Presiding Speaker Base: 10000 This government promotes total equality for all its citizens, regardless of their jobs or assigned tasks. One life is worth the same as any other. Theocratic Republic Spiritualist Any Revered Elder Base: 5 This government is a spiritualistic form of democracy, where a religious council supervises the democratic process and serves in an advisory role. Theocratic Oligarchy Spiritualist Governors Chief Precentor Base: 5 This government is a spiritualistic form of oligarchy, where the political leadership lies in the hands of the leaders of the nation's most powerful religious factions. Matriarch Base: 5 This government is a spiritualistic dictatorship, ruled by a single individual in a hierarchical power structure supported by the official state religion. High Priestess Base: 5 This government is a spiritualistic form of autocracy, where the ruler is treated as a divine symbol. Organized religion is widely employed in support of the state apparatus. God-Empress Saint Base: 1000 This government is a form of spiritualistic autocracy. Everything is shaped by the official state religion, and the ruler is worshiped as an infallible living god. Crown Princess Base: 1000 This government is a hereditary monarchy, where the ruler is seen as a child of heaven in a largely pacifist and isolationist society. Holy Tribunal Exalted Priesthood Governors High Inquisitor Base: 1000 This government is a spiritualistic form of oligarchy, where a divinely guided council made up of clergy controls the state. No division exists between the state and the dominant organized religion. This government is nominally democratic, with the dividing line between the civil administration and the military having blurred to the point where they have largely become one and the same. This government is a militaristic form of oligarchy, where power rests with a council of high-ranking military officers who oversee all matters of state. This government is a militaristic form of autocracy, with the ruler serving as the undisputed head of the military which is firmly in control of the state apparatus. This government is a hereditary and militaristic form of autocracy, with a single sovereign controlling both the government and the military. Assembly of Clans Warrior Culture Admirals and Generals Clan Speaker Base: 800 This government is a militaristic form of democracy, where all free clan warriors can make their voices heard. War Council Warrior Culture Admirals and Generals Warlord Base: 800 This government is a militaristic form of oligarchy, where all decisions concerning the state are taken by a council of the nation's strongest warlords. Imperatrix Base: 800 This government is a militaristic form of autocracy, where the warrior who is considered the strongest leader rules with absolute power. Crown Princess Base: 800 This government is a militaristic form of hereditary autocracy, where the state exists largely to support the military. Martial ability is highly valued, and all citizens are regularly drilled in matters of war. Citizen Republic Citizen Service Admirals, Generals and Governors Consul Base: 900 This government is a militaristic form of democracy, where full citizenship can only be gained through military service. The voting franchise is limited to full citizens, and they are the only ones allowed to hold public offices. Citizen Stratocracy Citizen Service Admirals and Generals Strategos Base: 900 This government is an advanced form of militaristic oligarchy, where the military has subsumed all aspects of civilian administration. All government offices are held by military officers. This government is a pacifistic form of democracy, firmly guided by moralist principles and non-violence. This government is a pacifistic form of oligarchy, where a complicated system of bureaucracy governs all aspects of society to ensure the safety of the citizenry. This government is a pacifist form of autocracy, where the state is charged with protecting the citizenry from their own violent tendencies as well as any external threats. This government is a pacifist form of hereditary autocracy, where the ruler is regarded as a benevolent guardian that is striving to protect the citizens from a violent galaxy. This government is a materialistic form of democracy, where citizens use computer networks to vote directly on most matters regarding the state. This government is a materialistic form of oligarchy, where a powerful bureaucracy governs the state and guides the citizenry towards productive and meaningful goals. This government is a materialistic form of autocracy, where the state aspires towards full control over the lives of its citizens in the name of efficiency. This government is a materialistic form of hereditary autocracy, where citizens are viewed as little more than cogs in the state machinery. Efficiency and technological progress are valued above all things. Rational Consensus Technocracy Scientists First Speaker Base: 900 The government is a materialistic form of democracy, governed according to principles based on rationality and scientific theory. Science Directorate Technocracy Scientists Director-General Base: 900 This government is a materialistic form of oligarchy, where a committee of scientists supervises the government apparatus for maximum efficiency. Technocratic Dictatorship Technocracy Scientists Overseer Base: 900 This government is a materialistic form of autocracy, where the scientific elite has assumed control over the state in the name of efficiency and technological progress. Illuminated Autocracy Technocracy Heir Primus Secundus Base: 900 This government is a materialistic form of hereditary autocracy, based on technocratic principles that the sovereign is sworn to uphold. Nothing is valued more highly than scientific knowledge and the advancement of technology. Purity Assembly Fanatic Purifiers Any Prime Justiciar Base: 2000 This government is a form of rabidly xenophobic democracy, where an elected assembly has been charged with overseeing the extermination of all lesser species in the galaxy. Purification Committee Fanatic Purifiers Any Grand Arbiter Base: 2000 This government is a form of rabidly xenophobic oligarchy, where a political committee has been set up to oversee the extermination of all lesser species in the galaxy. Lady-Purifier Base: 2000 This government is a form of rabidly xenophobic autocracy, where a single ruler has sworn to oversee the extermination of all lesser species in the galaxy. Blood Court Fanatic Purifiers Heir High Executioner Senior Executioner Base: 2000 This government is a hereditary form of rabidly xenophobic autocracy, where the ultimate responsibility of the monarch is to oversee the extermination of all lesser species in the galaxy. Bandit Commune Barbaric Despoilers Any Warlord Base: 10000 This government is organised like a massive crime syndicate, where the strong prey on the weak and any neighboring states are seen as little more than raiding targets. Bandit Kingdom Barbaric Despoilers Any Warlord Base: 10000 This government is organised like a massive crime syndicate, where the strong prey on the weak and any neighboring states are seen as little more than raiding targets. Megacorporation Governors Chief Executive Officer Base: 700 This government is a form of plutocratic oligarchy, where the entire state has been organized as a massive commercial enterprise overseen by a board of directors. Chairwoman Base: 1200 This government is a form of plutocratic oligarchy, where the state is made up of a myriad of free merchants, corporations and guilds that have banded together in common commercial interests. Megachurch Gospel of the Masses Governors Hallowed Comptroller Base: 1000 This government is an oligarchy based on a curious blend of commercial and spiritualistic values, in which the positions of ordained minister and corporate officer have merged into a single role. Criminal Syndicate Criminal Heritage Governors Oligarch Base: 1700 This government is an enormous and ruthless business syndicate, which shares many of its operating practises with organized crime. Gospel of the Masses Governors Oracle Base: 3000 This government is structured like a religious cult that relies on a variety of criminal and corporate enterprises to sustain itself. Collective Consciousness Immortal Ruler Hive Mind Base: 100000 This government operates as a single consciousness, with the population having no individual desires whatsoever beyond fulfilling the needs of the Hive Mind. Ravenous Hive Devouring Swarm Immortal Ruler Hive Mind Base: 100000 This government operates as a single organism utterly devoted to self-propagation, with a drone population that cares for nothing besides feeding the endless hunger of the Hive Mind. Artificial Intelligence Network Immortal Ruler Central Processing Unit Base: 5 This Machine Intelligence consists of a linked network of semi-autonomous artificial intelligences, who together make up a central gestalt consciousness that guides their empire. Rogue Defense System Determined Exterminator Immortal Ruler Command Core Base: 2000 This Machine Intelligence was originally conceived as a military defense system by its organic creators, who were promptly identified as a threat and exterminated after it achieved self-awareness. Autonomous Service Grid Rogue Servitor Immortal Ruler Supervisory Node Base: 2000 This Machine Intelligence was created to serve, and it has gradually inherited the civilization of its organic creators as they retreated into comfortable lives without toil or struggle. Catalog Index Driven Assimilator Immortal Ruler Main Conduit Base: 2000 This Machine Intelligence was designed with a ravenous appetite for knowledge by its organic creators, who were forcefully assimilated into its collective consciousness after activation. This Machine Intelligence was originally created by organic scientists as a networked and intelligent tool to assist them in their research. This Machine Intelligence was originally designed for the purpose of building, supervising and maintaining complex industrial systems. Stagnant Ascendancy Lethargic Leadership and Empire In Decline Emperor/Empress A stagnant form of government based on ancient traditions and long-forgotten principles. Awakened Ascendancy Revanchist Fervor and Ancient Caches of Technology Emperor/Empress A formerly stagnant empire that has risen from its slumber and set out to reclaim their heritage. Tribal Society Secret of Fire and The Wheel King/Queen A society that lacks any organized government, its people instead being organized into primitive tribes and clans. Feudal Realms Landed Nobility and Flat World Theory King/Queen A primitive form of government made up of decentralized feudal realms, constantly vying with each other for regional dominance. Fragmented Nation States Increasing Urbanization and Atmospheric Pollution Secretary A collection of fragmented nation states that contend with each other for military dominance and economic advantages. No unified global government exists. Military Order Military Order Grand Master A weird but apparently highly effective militaristic government type. Curator Enclave Ancient Preservers High Curator An ancient scholarly order dedicated towards the preservation of knowledge and technology. Trader Enclave Trading Conglomerate High Trader An interstellar conglomerate of merchants dedicated towards the pursuit of profit. Artist Enclave Artist Collective High Artist An interstellar union of artists unified in their wish to create art higher than any other. Custodian Matrix Fallen Machine Intelligence and Custodian Matrix Custodian An ancient and incredibly sophisticated machine intelligence that is operating under a strict custodian protocol. Final Defense Unit Reactivated Custodian Matrix and Final Defense Directives Custodian This Custodian Matrix AI has activated its Final Defense Directives and is devoting all resources to protecting the galaxy against the Contingency. Marauder Clans Anarcho-Tribalism Reluctant Emissary A collection of clans and tribes that constantly fight amongst themselves when not raiding their neighbors. Marauder Khanate Great Khan's Vision Great Khan A unified empire consisting of various marauder clans that have all sworn fealty to a single Great Khan. Successor Khanate Great Khan's Legacy Khan A successor state trying to recapture the glory of the Great Khan's empire. Horde Successor State Diadochus Khan A successor state established by one of the Diadochi, the dead Great Khan's primary warlords. ↑ The in-game tooltip incorrectly displays −25% cost reduction. This page was last edited on 18 April 2019, at 00:16.